Forged Johnny Joint® rod ends feature forged steel construction, a 1 1/4"-12 right hand threaded shank and come fully assembled with our standard Johnny Joint® internals (2.625" wide ball center with a 9/16" thru bolt hole). 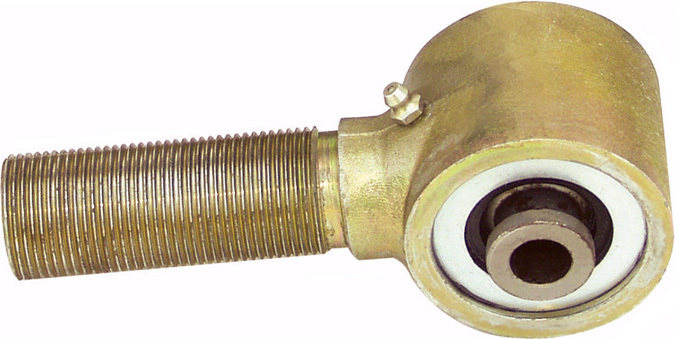 These units are externally greasable via a zerk fitting. 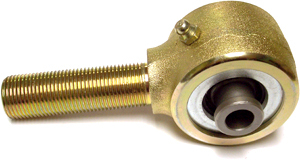 Units will also accept our 9/16" greasable thru bolts as well (available seperately). Finished in gold zinc plating. We also keep the jam nuts for these units on hand at all times as well. Weight: 4 Lbs, Height: 6 In., Width: 3 In., Length: 4 In. For fabricators and suspension system builders. Currie's Johnny Joints® offer 30 degrees of unrestricted movement in any direction as compared to 22 degrees on a common heim joint. The bushings in the Johnny Joint® rod ends are made with a high-density, "tough 88" urethane that encases the inner ball. It is a very durable material, and is impervious to weather. The special ball is heat-treated steel for extra strength. 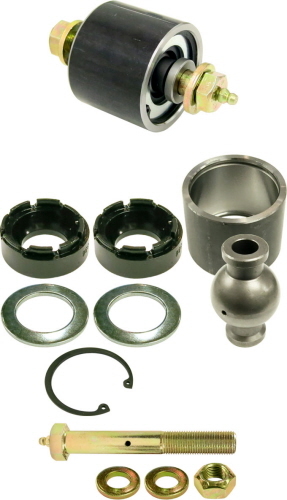 The 3" joint is lubricated via a zerk fitting on the outer shell -- an outer shell constructed of tough 4130 chromoly. 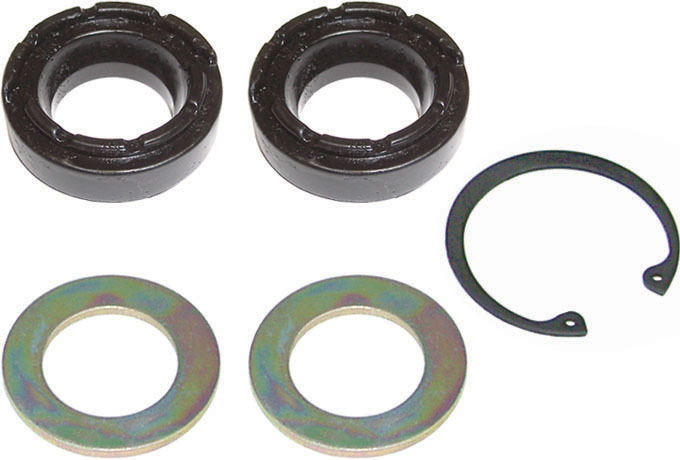 The retaining washers are machined out of 4340 chromoly and feature a snap ring safety machined into their face to protect the snap ring from coming out. The center ball is heat-treated chromoly steel for extra strength and features a 3/4" thru bolt hole and a 3 1/4" mounting width. Weight: 3 Lbs, Height: 4 In., Width: 4 In., Length: 4 In. 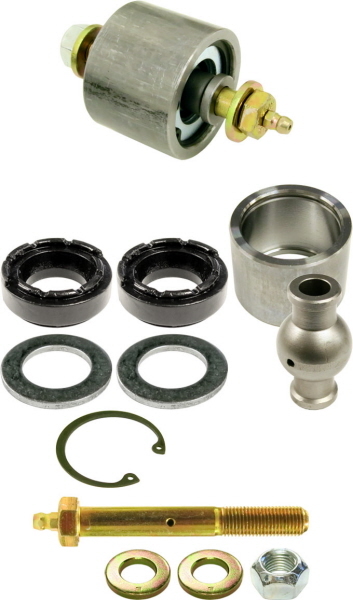 This 3" Johnny Joint® rebuild kit includes 2 urethane bushing halves, 2 side washers and 1 snap ring. 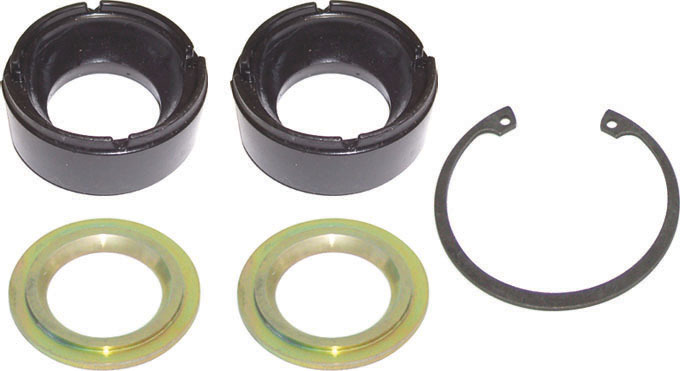 NOTE: Bushings are 2.535" in diameter. Weight: 1 Lbs, Height: 4 In., Width: 4 In., Length: 4 In. For fabricators and suspension system builders. Currie's Johnny Joints® offer 30 degrees of unrestricted movement in any direction as compared to 22 degrees on a common heim joint. The bushings in the Johnny Joint® rod ends are made with a high-density, "tough 88" urethane that encases the inner ball. It is a very durable material, and is impervious to weather. 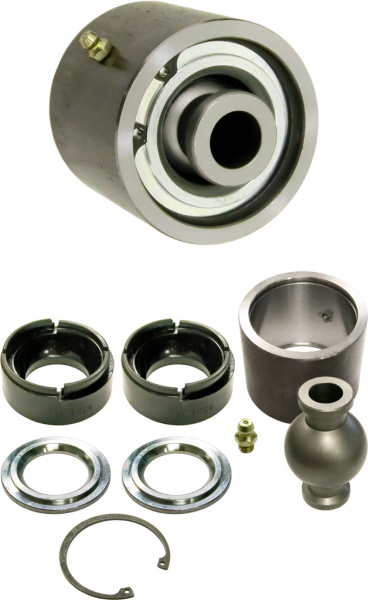 The special center ball is heat-treated steel for extra strength, cross-drilled for thru-bolt lubrication, features a 7/16" thru bolt hole, and a 2" mounting width. The outer shell is .180" DOM tubing, and the retaining washers are heat-treated steel. 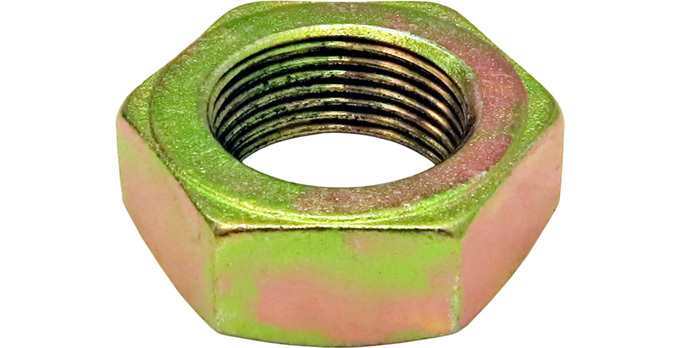 7/16" greasable bolt with nut and washers included. Weight: 1 Lbs, Height: 4 In., Width: 4 In., Length: 4 In. All new from Currie, forged Johnny Joints®!!! We have taken the Johnny Joint® to the next level by making a male rod end style forging that accepts the Johnny Joint® internals from our CE-9112 2" Johnny Joints®. This version features a 7/16" thru bolt hole, a 2" mounting width, 2 1/4" of 3/4"-16 right hand threads on the shank, and is greasable through the outer shell. 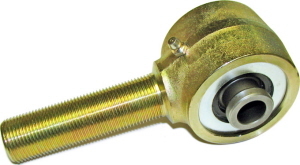 Units will also accept our 7/16" greasable thru bolts as well (available seperately). We also keep the jam nuts for these units on hand at all times as well. These can be used in any Currie adjustable upper control arm, as well as in any type of universal application for those building their own arms. Finished in gold zinc plating. Weight: 1 Lbs, Height: 4 In., Width: 4 In., Length: 4 In. Custom machined, left hand thread, weld-in bung for use with forged Johnny Joint rod ends or any other 3/4" thread rod end. Hex shaped - not round - for ease of bar adjustment. 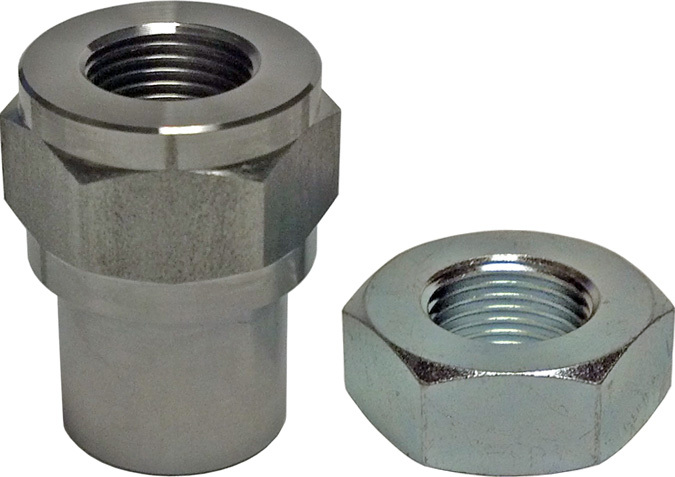 Also included with this bung is a custom machined jam nut that is the same hex size as the bung. Designed to fit into a tube with a 1" i.d. Weight: 1 Lbs, Height: 4 In., Width: 4 In., Length: 4 In. 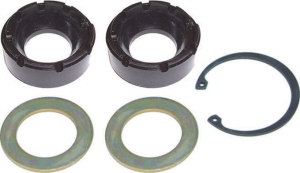 This 2" Johnny Joint® rebuild kit includes 2 urethane bushing halves, 2 side washers and 1 snap ring. NOTE: Bushings are 1 5/8" in diameter. Weight: 1 Lbs, Height: 4 In., Width: 4 In., Length: 4 In.